After publishing the guest rant about the decline in BranchOut user numbers by Marc Drees, and the response from the platform themselves, I was contacted by Chef recruiter David Hall, to say that no one had yet spoken on behalf of the Branchout users, and that he had a few things he wanted to get off his chest. I’m glad to add the users voice to the conversation. I hope BranchOut are listening to what he has to say. Much has been written about BranchOut and most of that has been about their stellar growth in users, or, more recently, the complete collapse in their user numbers. Some very good pieces on this from Marc Drees. Mr. Boorman on the other hand has led the cheering, credit where it due for allowing us dissenters some headroom. The Silicon Valley blogosphere takes a slightly different tack and occasionally gushes about BranchOut’s other numbers, their blowout fundraising rounds, $49Million and counting. But what about the product itself? Has it got anything serious to offer us or is it the reason users seem to sign up and seldom, if ever, go back? This post won’t be covering every area of BranchOut’s functionality, perhaps I’ll save that for another day, but will instead focus on a couple of features of most concern to recruiters. In case you’ve been hiding out in a bomb shelter the last two years, BranchOut claims to be a professional network built on top of Facebook. Once you install the App on Facebook you can see which of your friends are already there. More than that you can see where they work and, here’s the biggie, where their friends work. From a recruiters perspective it doesn’t take long for the penny to drop that BranchOut is potentially a huge disrupter and that’s the way BranchOut encourages you to think about them too. The idea is that BranchOut’s reach is potentially much vaster than LinkedIn, XING or VIADEO put together and in theory this is the case, no one can touch Facebook’s almost one billion users. Yes the Profile Data will be less rich than on any of those business networks but no sourcer worth the name would balk at shallower profile data with those numbers on offer. Give us just the merest shrivel of data and we’ll go to work filling in the blanks. Rather than do an exhaustive “BranchOut for Idiots” today I’ll confine myself to sharing with you my own experience of testing whether, on BranchOut, your network really is stronger than you think. I joined BranchOut at the time they still had the platform “gamified” to encourage connection promiscuity i.e. connecting with as many people as possible. There were badges on offer for various network milestones such as your number of direct connections and your number of extended network connections. There was even a leader board. I quickly figured that in the early stages of a network a healthy amount of super connectors is a good thing from the perspective of the platform owners, it creates activity and helps people extend their network reach fast. I also figured that for a recruiter it would be foolish not to take advantage of a situation which might not last forever. Both Linkedin and XING employ various strategies to discourage, or at least limit, such behavior and it wasn’t such a big leap from there to the assumption that sometime in the future BranchOut would too. So I dived right in determined to get some early mover advantage. I quickly noticed that with only a handful of direct connections I was already over the 10K mark in network size; all very early and all very encouraging. This early indication of BranchOut’s ability to, ahem, branch out was to prove highly misleading but we’ll get to that later on. So (un)suitably encouraged I went on a program (spree) of sending connection requests by the bucketload to people within the Catering and Hospitality industry, especially Chefs. That’s what I do, connect Chefs to Chef Jobs. In digress, BranchOut made all this pretty easy and never imposed any limits so I kept on keeping on. It was only sometime later that it became apparent that something was wrong, very wrong. 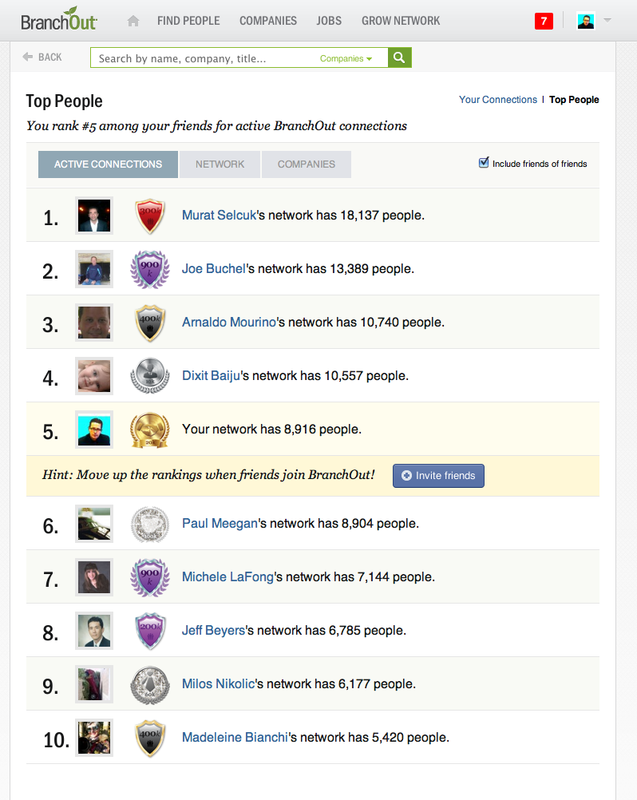 The early signs of this showed up on BranchOut’s own “Leader-Boards.” There were two of these back in the day, one would show you how you ranked in terms of direct connections i.e. First Degree Connections and the other would show how you ranked in terms of your network strength i.e. Second Degree Connections. Over time it was difficult not to become aware that those who had the strongest networks, by some margin, had a relatively modest number of First Degree Connections and that none of those with the largest, largest by a huge margin, number of First Degree Connections seemed to get anywhere near the leader board for Network Size i.e. Second Degree connections. This was far from being the smoking gun, that something was broken, but it was a bad sign, bad enough for me to take a look at my own numbers. I noticed that I was now up to about 6-8K (I’m doing this from memory) First Degree Connections but that my network of Second Degree Connections was only in the low to mid 20K. That’s a derisory return of something in the region of 3.5 Second Degree Connections for each First Degree BranchOut connection. Now bear in mind that your Second Degree Connections on BranchOut include your contacts First Degree BranchOut connections PLUS their FaceBook friends. Taking this into account I knew something was really amiss so I got in touch with BranchOut support by email and explained to them what I’ve just explained to you. This was to prove to be a very long and frustrating relationship, most of which I’m going to spare you, but in this instance they had an explanation for what was wrong, you see there wasn’t any issue with BranchOut, no, there was an issue with the people I had connected with, apparently I’d somehow managed to connect with a demographic of 6-8K whose only friends or connections in the world were each other. Yes, inadvertently I’d connected with the loneliest souls on the planet, at least that’s what BranchOut seemed to be saying. While no expert in probability theory but facing a support department straight from a Kafkaesque dystopia I went into polarity mode and decided upon the most direct route to volleying BranchOut’s return of serve. 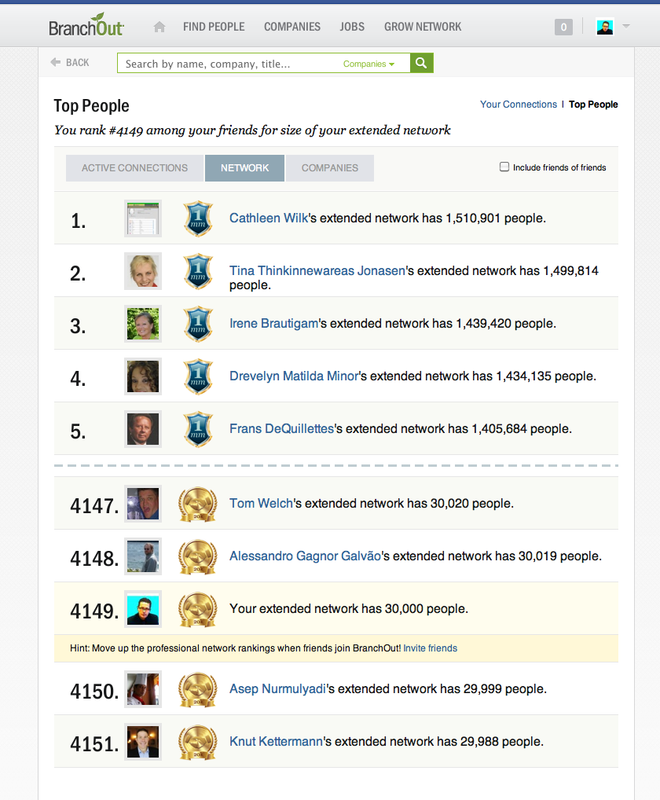 I simply sent connection requests to all the connections of the top five people on BranchOut’s own Network Size Leader Board. If BranchOut were right, and I knew as well as they did that they weren’t, my network size should quickly start to get massive traction. The big downside to this was that I was now connecting to profiles of little or no strategic value to someone working in a Chef Recruitment Agency. But so what, this was, after all, a business network which was Gamified (slogans “like build your BranchOut Empire” Badges and Leader Boards made this much clear) to encourage promiscuous connection activity; it wasn’t as if there was some unspoken or hidden rule that once you hit 10K direct connections BranchOut would effectively shut your account down, forbidding you to send or even accept any more connection requests (however outstanding requests you’ve already sent may be accepted thus lifting you over the 10K limit). As I was to find out later on that’s exactly what would happen to me, and as I know, many others too. Thanks for playing our game kids you did great, now here’s your punishment, we’re going to cripple your accounts and ditch those Leader Boards. That’s BranchOut for you, they really do know how to treat their most loyal users. However not knowing any of this at the time I kicked on and connected with the top networkers connections and arrived where I am now, the proud owner of a BranchOut network of Direct, First Degree Connections of over 15K. And, you may wonder, how did that experiment help the size of my network of Second Degree Connections grow? What sort of scale did I hit? Well, it gives me no pleasure to disclose that the ratio of Second Degree Connections to First Degree connections actually collapsed rather than grew. My Network Size, from a total of 15K First Degree Connections, is now a whopping 33k i.e. roughly 2.2 Second Degree Connections for each First Degree Connection. So much for BranchOut’s theory that I was connecting to the wrong people. Connecting to the right people makes things even worse. You might question why BranchOut can’t even seem to agree with itself about the number of direct connections I can boast is it 14,688 or is it 15,030? If you can figure that one out be sure to use comments to let me know. So what’s searchable on BranchOut? In theory you should be able to search the profiles of your BranchOut connections, their BranchOut connections (in fact every BranchOut profile) AND, here’s the Holy Grail unavailable elsewhere, their Facebook friends. Even with only relatively shallow profile data, compared to XING, LinkedIn etc, this is like honey to a bee for any recruiter and is potentially a way to get to a huge database of less senior candidates who haven’t yet created any profiles on the aforementioned business networks. To me this is potentially manna from the heavens, if only I were being asked to source senior level Executive Chefs every day I’d be sorted with my existing networks on XING and VIADEO, but I’m not, or at least not often enough, so the promise of BranchOut was for me, unfortunately, irresistible. Space, and your patience, being limited resources I’ll now present to you now the outcome of just one BranchOut query which supports the thesis that there is much wrong with BranchOut’s engineering and its ability to serve as a business network to rival any of the incumbents. I’ll keep it broad by searching for “Ritz Carlton” an international brand of upmarket hotels with an wide international geographic spread. No, your eyes aren’t deceiving you, that really does say 3,756. 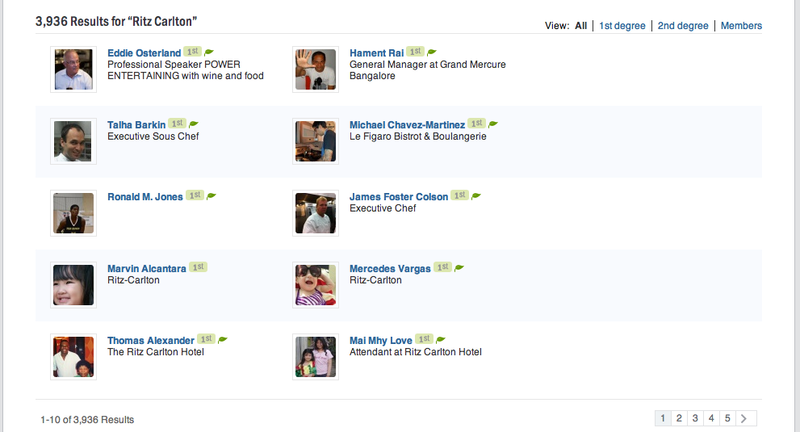 Ok to avoid being accused of overstating the issue, remember that BranchOut is supposed to show me only the profiles of BranchOut members with “Ritz Carlton” in their “BranchOut” profile data PLUS the Facebook profile data of the friends of my BranchOut First Degree Connections. Still a poor figure though. For comparisons sake, with a much smaller network on XING and much fewer First Degree Ritz Carlton connections I scale to about 16k Ritz Carlton Second Degree connections. A total of 187, not bad and a lot more than I have on XING. But what about my second degree connections, how many of those have I managed to bag thanks to BranchOut? Yes, 299! 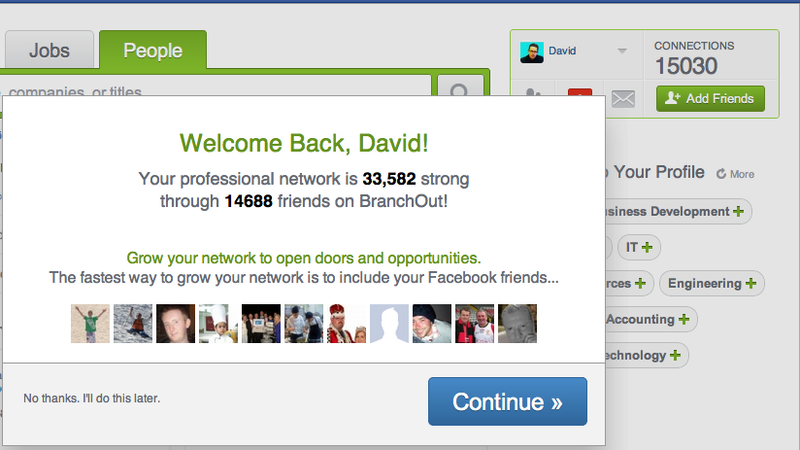 Thats a far cry from the 16K a couple of dozen First Degree XING connections earn me, and BranchOut is, remember, a business network built on top of Facebook’s user base of over 900Million, that’s a lot more profiles to shuffle than XING’S quite modest 12-14Million. I could go on and on about BranchOut and its shortcomings but this has to end somewhere, at least for today, and it might as well end here. Is there a happy postscript? No! I’ve been back to BranchOut since connecting to the super connecters network and, as a consequence, seeing an even greater collapse in my network strength. Given my experiences with BranchOut’s support department I didn’t entertain high hopes that my newly acquired “proof,” that they weren’t passing on network value to me, would shake them from their resolutely “not our problem dude” method of issue resolution. Having set my expectations to the lowest set on the dial BranchOut managed to surprise me again, but not in a good way, in fact this time they outdid themselves in the buck passing stakes. Apparently now the issue isn’t that I’ve connected to the biggest lonely hearts club in cyberspace but rather that I’ve exceeded their brand new, never announced, silent limit of 10K direct connections thus introducing a bug into my account. Yup, my fault again! There really was no point in arguing that this happened precisely because the issue existed before I went over the 10K or even before anyone I know had heard of any limit on direct connections on BranchOut or even that their refusal to admit that there was a problem in the first place is was the very thing which caused me to crash through their secret ceiling of 10K. It makes no difference to BranchOut whose message is, essentially, tough luck dude. This is a message an increasingly large number of their users are taking to heart as they head for the BranchOut exit doors. If you’re still wondering whether to invest any time, or effort, in BranchOut (and if you’ve really read this far you shouldn’t be) my advice is no, run as fast as you can and forget you ever heard of BranchOut. The platform simply doesn’t work in line with expectations and the people behind it, in my experience, have never once exhibited the slightest sign that they have any concern for the type of experience their users are having on their platform. So is BranchOut headed for the dead pool? No, not just yet. They’ve raised $49million in VC so far (easily the most impressive thing about them) and still have at least 25million, probably more, users signed up, which if the platform can be made work consistently well for everyone, a big if mind you, means they could save the day yet. If there’s any hope of that happening they need to stop dreaming of a fabulously lucrative exit (or that exit needs to happen real soon allowing someone new into the building to fix things, before it really is too late) and get down to the hard work of developing a platform which offers real utility to its users. Oh yeah and a few courses in “service recovery” wouldn’t go astray either; blaming the customer for your own product’s miserable shortcomings doesn’t resolve issues, it makes them fester. When David Hall isn’t taking BranchOut to the Woodshed he blogs occasionally about Chef Recruitment and can also be found on a couple of business networks which do work as advertised,Twitter, XING and VIADEO. Thanks David for your contribution to the BranchOut conversation. It is good to hear comment from someone who uses the platform before forming an opinion. I hope the guys from BranchOut are listening to your feedback. Bill thanks again for the platform to discuss BranchOut. However I think, at least in this instance, the term “Rant” is an unwarranted devaluing term, especially so now that it’s emerged that Glen Cathey is on my team when it comes to BranchOut (I note from your most recent post that you’re as big a fan of Glen as I am). If “rant” is to apply to demonstrable and reproducible evidence that BranchOut is a clown car of a platform then surely it’s only fair to preface any puff pieces appearing elsewhere on this subject as “Cheerleading.” A devaluing term I don’t see applied to such pieces. On the other hand if anyone is inclined to put together a piece demonstrating, using credible sample sizes, the contrary to my argument I’ll be delighted to see it. Until then it’s my contention that cheery, upbeat copy on the subject of BranchOut should be dismissed as cheerleading. Anyone going to bat for them in future needs to get back on the other side of the looking glass because the emperor, in this case, is stark naked. As for BranchOut listening to my feedback, well Bill they’ve not had to wait for this to appear to get my feedback, they’ve been getting it since about October 2011, everything from diagrams, charts and even screencasts demonstrating the suckage of their platform, and I’ve yet to get any satisfaction from them. Rant: “To speak agressivly about somthing. or to take your own tangent about a subject and talk for a long time in a passionate manner.” i think the post fits the latter. Bill the comment is a “rant,” I think the piece is more of an “expose,” or even a review. This product simply doesn’t come close to working as advertised and my challenge stands, if you, or anyone else can demonstrate this product actually working (using statistically meaningful sample sizes) I’ll not only eat my hat, I’ll eat yours too (one of your smaller ones). BranchOut have been given, Marc Drees and a couple of exceptions aside, an incredibly easy ride by the social recruitment blogosphere and if there’s an element of irrationality in the overall commentary it lies with those who talk this product up, not those who’re calling it out for the car crash it most certainly is. The reason I’m a tad belligerent about this is that I too have attended social recruiting seminars (not yet one of yours mind Bill) and I drank the kool aid they were serving about BranchOut and the problem is that when BranchOut is bigged up in this way it’s not a victimless crime. People take to heart these recommendations, I did, and people end up wasting whole rafts of their valuable time as a result, I did. This comes down to a credibility issue and it’s one I think “thought leaders” in the social recruitment business need to take very seriously if the sector isn’t to be tarnished by the hint that snake oil is being sold. In the race to make sure they’re not missing a trick everyone in this business seems to jump all over the shiny new thing and endorsements quickly follow. If any peevishness is communicated by me it’s because I had to wait for Glen Cathey to validate my own experiences for me. After all Bill, and I’d be very surprised if you disagreed, if Glen Cathey can’t extract utility or value from BranchOut who on earth do you propose could? 1) The advertising product – which I think offers targeted reach, particularly with the matching tool. 2) The significant growth earlier this year when they launched the mobile product and grew to over 24Mn MAU in 2 months. I think that was newsworthy. 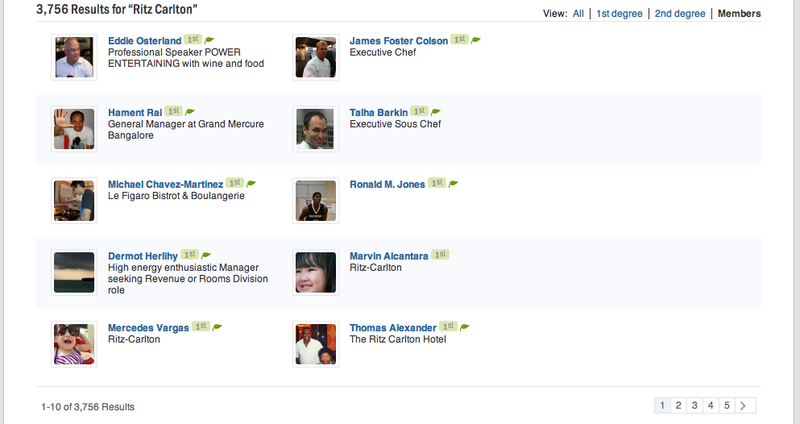 3) The integration in to the job boards, in particular TotalJobs. Similar to Beknown from Monster, I think this integration in between traditional on-line media and Facebook is the real story. What is interesting now is that many of BranchOuts features are being adopted by other players. Glassdoor in paticular are using similar methods to grow users. There is plenty of BranchOut in BeKnown. the get referred feature is starting to become the norm in recruiting products like Jibe etc.As a pioneering company in this area, even if they get it wrong quite often, then they are worthy of recognition and comment. Without pioneers we get nothing. If you would prefer I took the post down now just ask. Bill let’s focus on one area of agreement: “I’m not convinced on the sourcing value without the enterprise product, which has now been withdrawn.” Neither am I and the withdrawal of the enterprise product suggests many things Bill but there’s hardly any point in going into them now. I closed out my “rant” by concluding that BranchOut have an ace or two up their sleeve, the $49Million they’re raised (and I’d be sweating hard if I’d any money in that fund) and the very large number of sign-ups they’ve bagged. That’s two huge assets in their favour. The only way they can blow this is if the platform itself simply isn’t fit for purpose and if they haven’t got, or fail to get, anyone with the coding chops to put things right. Remember they’re supposed to be a recruiting platform, if they, of all people, fail to hire the right talent in time it will become one of Silicon Valley’s more ignominious final laps on the way to the deadpool.